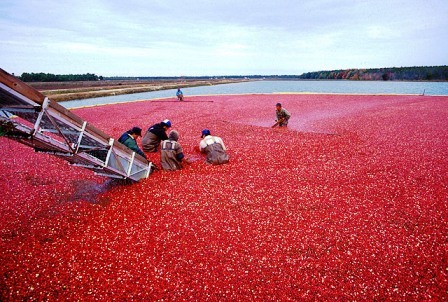 American cranberry is native to eastern portions of the United States and Canada. Its native range extends from Newfoundland, south to the higher elevations of North Carolina, and west to Minnesota. The American natives used the fruit medicinally, as a food flavoring, and as a dye. The commercial cultivation of this fruit, however, started in early 19th century, in Massachusetts. Records indicate that Henry Hall was the first to start an American cranberry commercial plantationin 1814. This fruit can be seen growing mostly in woodland gardens, sunny edges with dappled shade growing usually as ground cover. A low-growing, stoloniferous, semi-evergreen perennial plant, 4-8” high. Flowers pale pink to white, 1.2 cm long, reflexed bell shaped, hermaphrodite and are pollinated by Insects; self-fertile, completely hiding the ground. Fruits 1-2 cm in diameter. The fruit is eaten fresh, though some people find it a bit sour in taste. It can also be cooked and made into a jam or jelly. It is also used in pies and preserves. The fruit can also be dried for off-season use. 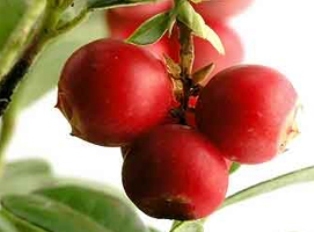 American cranberry fruits are rich in vitamin C.
cranberry sold in the United States. 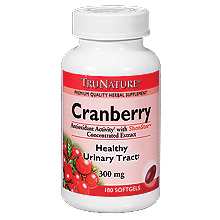 Medicinally, cranberry is used today primarily to prevent bladder infections. It may also help to treat infections once they are established. Cranberries are becoming an important cultivated crop in Canada. Almost all berries on the market are farm-grown. This fruit should be tried elsewhere too. The plant prefers light (sandy) and medium (loamy) soils, requires well-drained soil and can grow in nutritionally poor soil. The plant prefers acid soils and can grow in very acid soil. It can grow in semi-shade (light woodland) or no shade. It requires moist or wet soil. 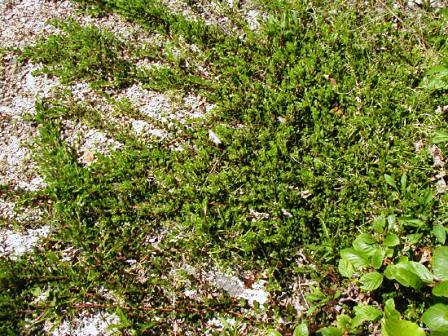 Plants can also be grown as a ground cover when planted about 1 metre apart each way. These spread rapidly. Though plants are self-fertile, but cross pollination by insects has been observed to increase yield. Cultivated plants take about 5 years to come into full bearing but will then crop well for 60 – 100 years. Propagation is by seed and cuttings. Though air layering is feasible, but it is slow and therefore not recommended. Early black: A small fruited early variety which is a good keeper. The plants of this variety have relatively more upright growing habit than others. Hamilton: This has red fruits. The plants grow into an outstanding miniature form, making a clump 10 x 12cm. 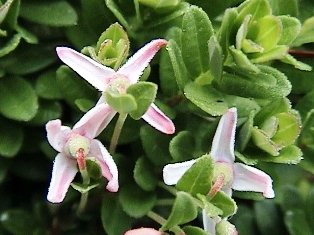 It slowly develops into a cushion on ground which in spring, is covered with pink flowers. Langlois: It is commercial cultivar, selected for its drooping flowers and very large red fruits. The plant attains a height upto 25cm and grows upto 45cm wide. McFarlin: This variety has large dark red berries with a tender flesh and extra fine flavour. Ripening is in mid season. It is not a very good keeper. Pilgrim: Large purplish-red fruit, ripening late and storing well. A prolific bearer, it is resistant to feeding by the leafhopper, an insect that spreads false blossom virus. Smack: Large well-flavoured fruit that makes excellent jellies, jams and pies. Wilcox: Fruits of medium sized fruits with a deep red skin. This variety ripens very early and stores fairly well. The plants are vigorous and very productive somewhat resistant to false blossom virus].